In this rebuilding season, the Marlins are taking the opportunity to evaluate several young starting pitchers at the Major League level. 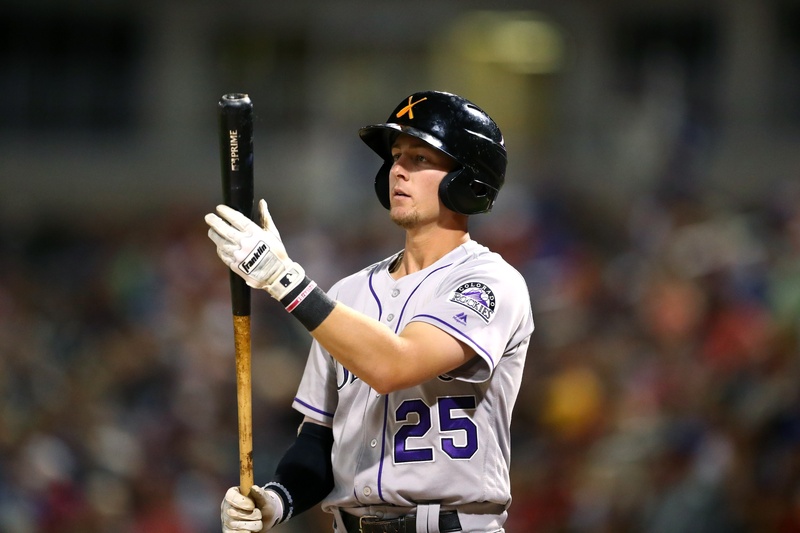 Dillon Peters and Trevor Richards are back in Triple-A after getting an extended look. Jarlin Garcia made six starts before being moved to the bullpen. He was replaced in the rotation by Rule 5 pick Elieser Hernandez. Triple-A starters Zac Gallen and Ben Meyer have both been good enough to warrant a promotion, and 22-year-old Pablo Lopez (1 ER in 31 2/3 IP) has been one of the best pitchers at the Double-A level. Next in line, though, should be Alcantara, the prized prospect acquired from the Cardinals in the offseason trade of Marcell Ozuna. After tossing eight shutout innings in his latest start, the 22-year-old right-hander’s debut with the Marlins has to be on the horizon. Alcantara doesn’t have the high strikeout rate that you’d expect from a top prospect, but he throws in the mid-to-high 90s—he averaged 98 MPH in eight relief appearances last season—and has been a strike-throwing machine as of late. Since walking 16 batters over his first six starts, Alcantara has been in control over his last three outings with only one walk in 20 innings, including back-to-back starts without issuing a free pass. As a comparison, he walked a batter in all but one of his 22 Double-A starts last season. If the Marlins hold off and give Alcantara two more Triple-A starts, he could make his ’18 debut when they face his former team in St. Louis between June 5th-June 7th. The Phillies’ rotation is on a roll—they have the sixth-lowest ERA in the Majors and the third most quality starts—and currently have no weak link in their five-man rotation. But despite lacking a clear path to the Majors, De Los Santos is making it obvious that he’s ready when needed. After allowing a run in each of his first three Triple-A starts, the 6’3″ right-hander stepped it up a notch with three consecutive scoreless outings, a quality start on May 16th (6 IP, 3 ER) and another gem yesterday (7 IP, ER, BB, 5 K). At just 22 years of age, De Los Santos is dominating at the Triple-A level (1.39 ERA, 3.0 BB/9 and 9.7 K/9) and also has a 150-inning season under his belt at the Double-A level. With the Phillies primed for a playoff run, it’s almost certain that the young workhorse will figure into their plans at some point. Replacing an accomplished 12-year veteran who is struggling mightily at the plate with an unproven prospect who is putting up huge numbers in Triple-A is not an easy decision. While the 35-year-old Ian Kinsler is no longer the hitter who slashed .288/.348/.484 with 28 homers back in 2016, he’s probably not as bad as he’s looked through his first 149 plate appearances of 2018, either (.197/.275/.288). Regardless, the Angels have to at least be considering whether it’s time to give the 23-year-old Fletcher a chance. After a subpar performance during his first full season in the upper minors in 2017 (.655 OPS in 111 games between Triple-A and Double-A), the former sixth-round draft pick has taken a huge step forward in 2018. He already has 20 multi-hit games and 28 extra-base hits—he had 24 total extra-base hits in 2017—while striking out just 13 times in 193 trips to the plate. A rare 0-fer on Tuesday has his slash line down to .356/.401/.599 in 192 plate appearances. 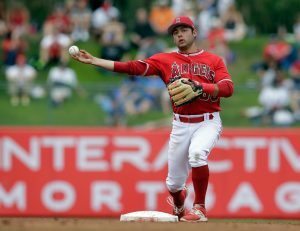 Capable of playing second base, third base and shortstop, Fletcher could be used in a utility role while taking at-bats away from Kinsler, who is currently in a 5-for-34 rut. 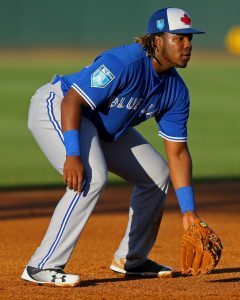 It’s not surprising that 19-year-old Vladimir Guerrero Jr. has been the most impressive and most talked-about prospect in Double-A since the start of the season. But Jimenez, who began the season on the disabled list with a strained pectoral muscle, is quickly making up for lost time. The 21-year-old debuted on April 19th and, after going hitless in his first 11 at-bats, is now hitting .328/.360/.608 with eight homers and 11 doubles. While he doesn’t have the plate discipline of Guerrero or Juan Soto, another impressive 19-year-old who made his MLB debut with the Nationals this past weekend, Jimenez doesn’t strike out a ton. He has 21 total strikeouts (a 15.9 percent clip) and has gone without a strikeout in 15 of his 31 games. When he does put the ball in play, it’s often very loud. There’s also a clear path to the Majors on a rebuilding White Sox team with one of the least-productive group of outfielders in baseball. Digging deep into their starting pitching depth is nothing new for the Dodgers. They’ve been doing it for years and, for the most part, their second wave of starting pitching has done an excellent job. This year has been no exception with Clayton Kershaw, Rich Hill and Hyun-Jin Ryu on the disabled list and Walker Buehler (2.38 ERA in six starts), Ross Stripling (3.26 ERA in four starts) and Brock Stewart (one run in four innings in his lone spot start) doing their part to hold down the fort. Next in line could be the 22-year-old Santana, who threw six shutout innings with only three singles allowed and 11 strikeouts in his Triple-A debut over the weekend. After he struggled badly in seven Double-A starts last season (5.51 ERA, 6.3 BB/9), an MLB debut in 2018 did not appear to be in the cards despite being added to the 40-man roster over the offseason. But that’s changed after eight impressive Double-A starts (2.56 ERA, 3.3 BB/9, 11.9 K/9) and, probably even more so, after whiffing 11 hitters without issuing a walk over six shutout innings in his Triple-A debut. Like Kenley Jansen and Pedro Baez, Santana started his professional career as a position player—he was a shortstop for one season after signing in 2013—so he should feel at home in the Dodgers’ clubhouse. The 2018 debut of “Knocking Down The Door” is here! Over the next four months, I will be identifying Minor Leaguers who I believe are putting themselves in position to earn a big league call-up in the near future. Walker Buehler and Gleyber Torres would’ve gotten serious consideration had they not already been promoted. Many others who make this list will get never get the call. Ask Chance Adams, who made this list in 2016 and 2017. Here’s a look at five Minor Leaguers who are currently “Knocking Down The Door” to the Major Leagues. The Rays didn’t get a great immediate return from the trade that sent away one of the best pitchers in baseball, David Price, nearly four years ago. Nick Franklin never panned out, and Drew Smyly made 49 starts in two and a half seasons before being flipped for outfielder Mallex Smith and lefty Ryan Yarbrough. 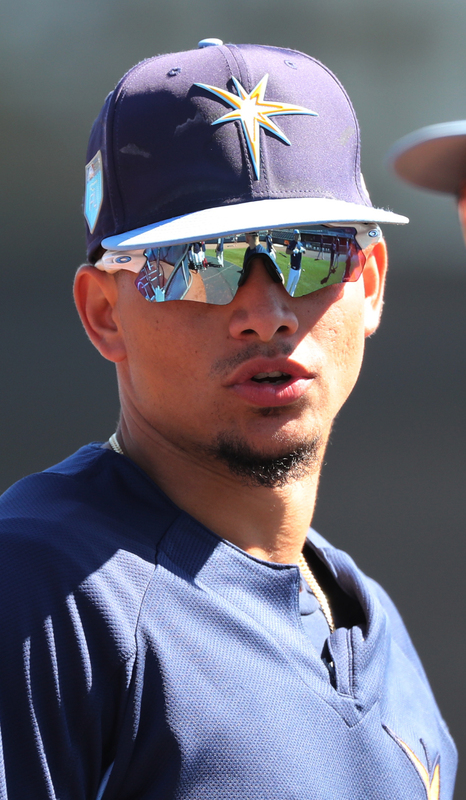 Smith and Yarbrough are both on the roster now and controllable for years, and the trade could soon pay additional dividends with the 22-year-old Adames closing in on the Majors. After hitting for the cycle Monday, Adames is slashing .345/.441/.582 in the first 16 games of his second Triple-A season. Year one wasn’t overly spectacular, though Adames was one of the league’s younger players at 21 years of age, and did have some very productive stretches. His strong start to year two, however, has to have the Rays’ infielders on notice. A current 10-for-22 hot streak could help the light-hitting Adeiny Hechavarria deflect any current thoughts of Adames taking his starting shortstop job. 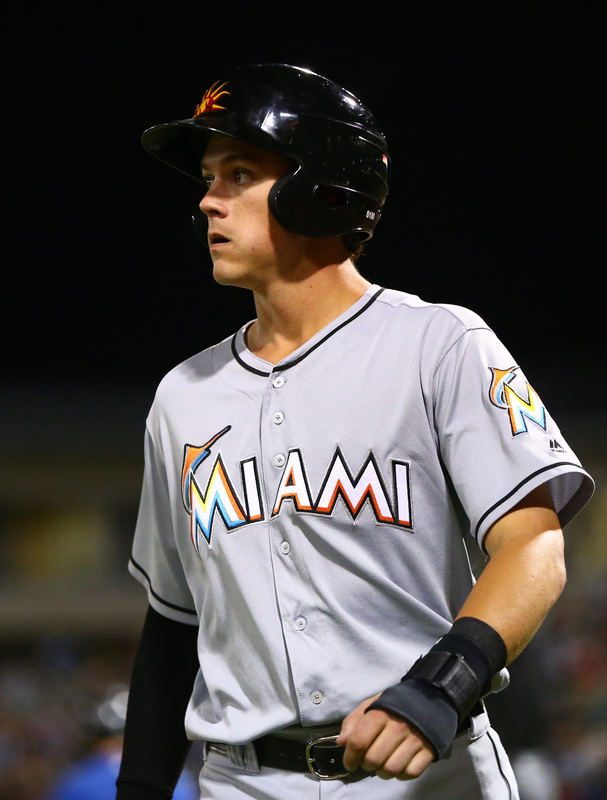 Second baseman Joey Wendle (.867 OPS) and fill-in third baseman Daniel Robertson, who went 4-for-4 on Sunday, are also doing what they can to extend Adames’ Triple-A tenure. In all likelihood, Adames will be in the Majors very soon. The only question is where he’ll play. While he should be able to make a quick transition to second base, he’s played all but 21 games in his career at shortstop (10 games at third base in the Dominican Summer League and 11 games at second base in ’17). With Hechavarria in the last year of his contract and the Rays unlikely to compete for a playoff spot, Tampa Bay could look to trade him or move him into a part-time role where he could help mentor Adames. The combination of Derek Fisher, Marwin Gonzalez and Jake Marisnick appeared to be a sufficient stopgap for top prospect Kyle Tucker, who would presumably need at least a few months in Triple-A before taking over as the team’s starting left fielder. But despite a strong start by the Astros, they’ve gotten very little production out of the Fisher-Gonzalez-Marisnick trio. While Tucker is doing just fine early on in his first Triple-A season (.270/.360/.392) and Tony Kemp continues to be productive (.324/.427/.405), it’s the 25-year-old Ferguson who is making the most noise. The former 19th-round pick is slashing .362/.457/.580 with two homers, five doubles and nine multi-hit games. He might not be the long-term answer in left field, but he could certainly give a spark to the Houston offense, particularly the bottom third of the order. It was three years ago that Kingham was closing in on an MLB rotation spot. After allowing one run through five innings in an early May start at theTriple-A level and striking out the leadoff man in the sixth, though, he exited the game with elbow discomfort. Kingham underwent Tommy John surgery a few weeks later and didn’t return until late in the 2016 season. Despite making 19 starts in Triple-A last year, he never quite made a push for a big league call-up. But after four starts into what is his fourth season in the International League, it appears he’s finally back on track. The 26-year-old pitched five shutout innings with 10 strikeouts in his 2018 debut, followed it up with back-to-back quality starts and another strong outing on Sunday (5 2/3 IP, ER, 6 K). While Steven Brault has done a decent job filling in as the No. 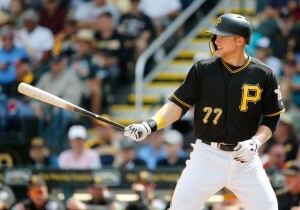 5 starter, he could possibly give the Pirates a bigger boost as a multi-inning lefty out of the ’pen. The same could be said for Joe Musgrove, a setup man with the World Champion Astros, who was slated to the be the team’s No. 5 starter before landing on the disabled list with a shoulder injury. But that all depends on whether Kingham can lock down a rotation spot once he’s given a chance. And he deserves a chance. A prospect of Kopech’s caliber isn’t necessarily waiting for a big league spot to open for him. When he’s ready, the White Sox will make room soon thereafter. But the need for a spot starter in Saturday’s double-header and an injury to Miguel Gonzalez—his spot is being filled by Chris Volstad on Tuesday and will come up again on Sunday—could at least force them to decide if the 21-year-old is ready now. One of the best pitching prospects in the game, Kopech has a 4.4 BB/9 and 11.6 K/9 since being drafted by the Red Sox with 33rd pick in the 2014 draft. But in six Triple-A starts (three at the end of ’17 and three in ’18), he’s shown more control (3.0 BB/9) while maintaining his high strikeout rate. In his most recent start, the right-hander walked one and struck out 10 in five innings of work. He’s yet to reach 100 pitches in any of his three starts—he surpassed that total five times in ’17—but as long as he continues to throw strikes consistently, he should be able to navigate past the fifth inning on a regular basis against MLB hitters. There is “dominant,” and then there’s whatever Poche has done in his first eight innings in Double-A. The 24-year-old lefty has allowed just one hit and one walk. Of the 24 batters he’s retired, he’s struck out 19. Left-handed hitters have yet to put a ball in play against him. He’s struck out all seven. Keep in mind that another Diamondbacks lefty, Gabriel Moya, also had great success in Double-A last season (0.82 ERA, 14.2 K/9 in 43.2 IP). But instead of getting the call-up for Arizona’s playoff run, he was traded to the Twins in July for backup catcher John Ryan Murphy. In other words, the front office wasn’t all that impressed with Moya despite him making this list a month earlier. Still, it’s impossible to ignore what Poche has done thus far. He should be able to help the D-backs at some point in 2018. Since a mid-July promotion to Triple-A New Orleans, the 24-year-old Anderson has been hitting like someone who knows he’s auditioning for a Major League job. 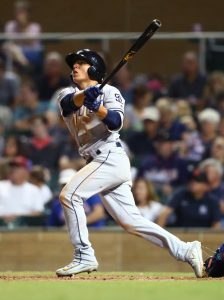 In 29 Pacific Coast League games, the right-handed hitting third baseman is slashing .350/.420/.631 with eight home runs and 12 multi-hit games. Dee Gordon and Martin Prado will presumably be on the trade block this offseason, and the Marlins wouldn’t pull the trigger on dealing either player without knowing if they have a potential in-house replacement (Prado could move to second base if Gordon is traded). If there is a Marlins prospect who is a candidate to step into a starting role in 2018, it would be Anderson, a former third-round draft pick. 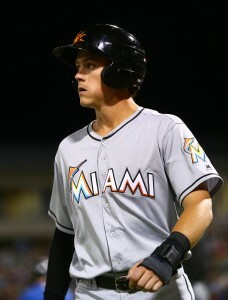 Calling him up in the near future and giving him 100+ plate appearances would give the Marlins a much better idea of how capable he is of becoming their starting third baseman next season. A shoulder injury that pushed Gonsalves’ season debut to mid-May could be a blessing in disguise for him and the Twins. While most starting pitching prospects are usually close to their innings limit in August and not expected to contribute much at the Major League level in September and beyond, Gonsalves is at 109 2/3 innings after his latest start. Considering that he threw 140 innings during a breakout 2016 in which he appeared very much on the fast track to the Major Leagues, it wouldn’t be a surprise if he’s pitching for the playoff-contending Twins late this season. The 23-year-old lefty was recently promoted to Triple-A following a dominant 28-start stint in Double-A (161 2/3 IP, 2.28 ERA, 6.1 H/9, 3.3 BB/9, 10.3 K/9) over the past two seasons. After posting back-to-back quality starts, Gonsalves struggled in his third Triple-A outing before bouncing back with another stellar effort over the weekend (6 IP, ER, 7 H, BB, 6 K). The Twins are currently in possession of a Wild Card berth with Bartolo Colon and Dillon Gee serving as their fourth and fifth starters, respectively. If they’re going to hold on, they might need to turn to their farm system one more time. Gonsalves could be the difference maker. The 23-year-old Lopez is only three months removed from pitching in the High-A Florida State League, but there are already several reasons to believe that he’s not far away from the Majors. After allowing 15 earned runs in his first 27 innings with Double-A Pensacola, the right-hander has been one of the best pitchers in the Minor Leagues. In his last 10 starts, he has a 1.24 ERA with 4.8 H/9, 1.6 BB/9 and 8.0 K/9. He’s completed at least six innings and hasn’t allowed more than two earned runs or five hits over that span. During Lopez’s first crack at the upper minors, he’s shown an ability to make adjustments, miss bats, throw strikes and pitch deep into games—he has a 68.5% strike rate and hasn’t thrown more than 96 pitches in any of his 10 consecutive quality starts. Tyler Mahle, who made this list on May 1st and June 27th, became the 15th Reds’ pitcher to make a start in 2017 when he made his MLB debut yesterday. Lopez deserves to be the 16th. The Cubs appeared to solidify what was already a deep and talented bullpen by acquiring lefty Justin Wilson at the trade deadline. Wilson has been mostly ineffective, however, while the team’s other key relievers have been unreliable, to put it kindly, over the past few weeks. It’s not quite a major area of concern at this point, considering the track record of the group, but it’s probably alarming enough to at least take a look at adding a reinforcement from the Minors, even one that began the season in High-A. Maples’ rise didn’t begin immediately after the team converted him to a reliever a few years back. His numbers out of the ’pen were unimpressive in 46 appearances in the low minors from 2015-16, but something has apparently clicked in 2017. In 51 appearances across three levels, including his last 16 with Triple-A Iowa, the 25-year-old has a 2.74 ERA, 6.2 H/9 and 14.3 K/9. The walks are a concern (5.3 BB/9), but he’s only walked more than one batter in three of his combined 30 appearances in the upper minors. It’s also worth noting that Carl Edwards Jr. had a 6.0 BB/9 in 24 Triple-A appearances last season but went on to finish the year as one of the best relievers on the World Series champs. Walker’s already difficult path to the Majors could not have taken a worse turn during the past offseason. With limited at-bats available in Baltimore behind Chris Davis and Mark Trumbo, the right-handed hitting first baseman was designated for assignment in February. The likelihood of a better opportunity lied ahead. But it never came. By the time the regular season started, he had been claimed on waivers by three different teams—Braves, Reds and Diamondbacks—that employed superstar first basemen who rarely miss a game. In late March, he was designated for assignment a fourth time, only to clear waivers and remain with the Diamondbacks. To his credit, the 26-year-old did not let the limited opportunity and removal from the 40-man roster affect him at the plate. After putting up what would be slightly below-average numbers for a first baseman in Triple-A during parts of the previous three seasons, Walker has taken his game to another level in 2017. In 565 plate appearances, he’s been the Diamondbacks’ Triple-A version of Paul Goldschmidt, slashing .312/.384/.609 with 32 homers and 34 doubles. While the Pacific Coast League is more hitter-friendly than the International League, where Walker played previously, his improved walk and strikeout rates (145 BB, 406 K from ’14-16; 58 BB, 97 K in ’17) are indications that a better approach at the plate has helped lead to his success. A September call-up is in the cards as the D-backs have gotten very little from their pinch-hitters in ’17 (.636 OPS), but they’d also do Walker a huge favor by either trading him in the offseason to a team where he has a chance to play or removing him from the 40-man roster—assuming he’s added in September—so he can opt for free agency. The Braves were non-contenders in 2016 when they surprisingly called up top prospect Dansby Swanson from Double-A and inserted him into the starting lineup. Out of playoff contention late in the season once again, would they do the same with the 19-year-old Acuña, considering how Swanson has mostly struggled in his first full MLB season? There is one notable difference between Swanson in 2016 and Acuña in 2017. Swanson was having a decent season in Double-A (.261/.342/.402 in 84 games) at the time of his call-up. Acuña has been absolutely tearing the cover off of the ball and seemingly getting better throughout the season during stints in High-A, Double-A and Triple-A. In 26 games since a July promotion to Gwinnett, the right-handed batter is slashing .347/.426/.574 with four homers, seven doubles, 13 walks and 22 strikeouts. While the Braves will likely explore a trade for one of their current outfielders this offseason in anticipation of Acuña’s arrival as an everyday player in 2018, they could work him into the mix late this season with three-to-four starts per week. The 23-year-old lefty was pitching in High-A less than a month ago, so a promotion to the Major Leagues soon after probably seems unrealistic. However, the recent trade of Francisco Liriano and the fourth disabled list stint for Aaron Sanchez has left the team’s rotation so thin that journeyman Nick Tepesch is being added to the 40-man roster to start on Wednesday to replace another journeyman, Cesar Valdez, who was placed on the disabled list after allowing 12 earned runs over his past two starts. Meanwhile, Borucki has been outstanding since a promotion to Double-A, posting three consecutive seven-inning starts with a total of 18 strikeouts while allowing only one earned run, 11 hits and three walks in 21 innings. The former 15th-round pick, who idolized Mark Buehrle as a kid and is comparable in many ways, is already on the team’s 40-man roster and only at 119 innings on the season. In six games since the July 31st trade that sent him from the Dodgers to the Rangers for Yu Darvish, Calhoun is 7-for-25 with four homers, pushing his season total to 27. Not only can the lefty-swinging Calhoun hit for power—he also had 27 homers and 25 doubles in Double-A in 2016—he’s one of the toughest hitters to strike out in the Minors. Hitting 25+ homers in the upper minors is notable, but accomplishing that feat while striking out fewer than 100 times is extremely rare. The 22-year-old struck out 65 times while drawing 45 walks in 2016. He has 36 walks and only 50 strikeouts this season. The good thing about being traded to the American League is that Calhoun’s future position in the Major Leagues, whether it’s second base or the outfield, probably doesn’t have to be sorted out before he gets the call to the Majors. The kid can flat out rake. With Mike Napoli struggling—he’s 4 for his last 32 with 17 strikeouts— the Rangers could give Calhoun plenty of at-bats at the DH spot with an occasional look at second base or in left field. After an impressive stint in Double-A earned him an early-season promotion to Triple-A in 2016, Crawford appeared to be on the fast track to the Majors. Of course, only the “light-hitting” Freddy Galvis appeared to be standing in his way at the time. 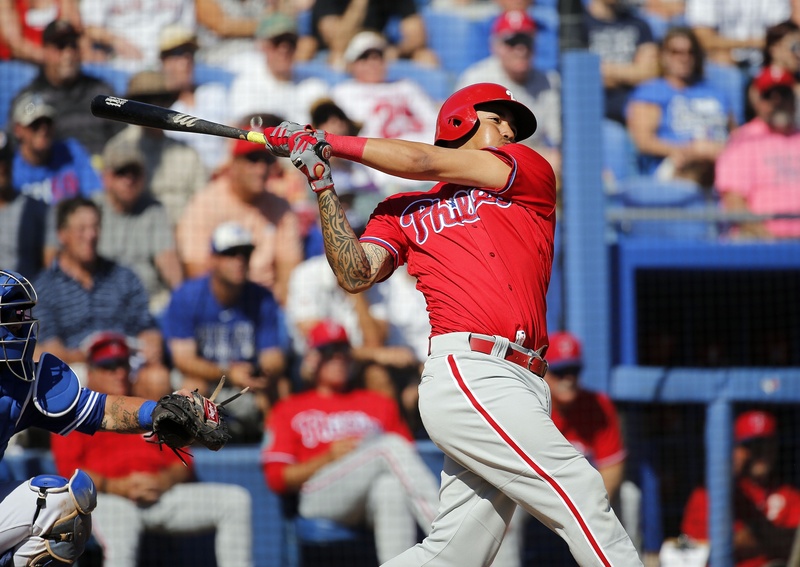 But in an unpredictable turn of events, Galvis went on a home run binge while the 21-year-old Crawford, considered one of the top prospects in baseball, struggled during his first taste of Triple-A. Since last July, Galvis has homered 24 times in 706 plate appearances while posting an OPS over .700. Crawford was never going to simply be handed the starting shortstop job, but any chance of a 2017 promotion was dwindling unless he forced himself back into the picture. His performance in July, and so far in August, probably fits that description. With an OPS over 1.000, 10 homers, six doubles, three triples, 21 walks and 27 strikeouts over that span, Crawford has earned a late-season look as the Phillies’ regular shortstop. Galvis, who will be a free agent after the 2018 season, has probably done enough over the past year to generate some offseason trade interest whether he plays regularly down the stretch or not. With the Phillies committed to giving Tommy Joseph a full season to show what he can do as the team’s starting first baseman, it appeared that Hoskins, one of the most productive hitters in the Minors over the past three seasons, would probably have to wait until 2018 before getting a chance. But following the release of Michael Saunders, the trade of Howie Kendrick, and Aaron Altherr’s second trip to the disabled list, the Phillies’ outfield is looking thin enough that the 24-year-old Hoskins was given the green light to play left field for the first time in his professional career on Monday. He played there again on Tuesday. While a slight increase in defensive versatility could be a key to Hoskins arriving in the Majors this season, maybe as soon as this week, it’s hard to imagine him not being the starting first baseman in 2018. Joseph is having a below-average season for a first baseman (.741 OPS, 16 HR, 97 K) and is currently in a 1-for-22 slump. Hoskins still has to prove that he can hit MLB pitching, but his current .280/.383/.571 slash line with only 75 strikeouts is a pretty good indicator that he will do just that. While the Rays were busy adding first baseman Lucas Duda and a trio of relief pitchers prior to the non-waiver trade deadline, they didn’t make the splash that they were probably capable of making based on the depth and quality of their prospect talent. The team’s likely unwillingness to include the 22-year-old Honeywell in a deal is probably among the top reasons. Not only is Honeywell one of the top pitching prospects in baseball, there’s also a chance that he can help the Rays down the stretch in the same way that rookie David Price did in 2008 when he pitched 14 innings in September and another 5 2/3 frames in the playoffs for the AL Champs. Since being named the Futures Game MVP, the right-hander has continued to look more and more comfortable in Triple-A, allowing only three runs and 12 hits over his past 16 innings while striking out 22. The window could close quickly depending on how quickly George Springer returns from the disabled list, but the recent trade of Nori Aoki could allow the Astros to give Kemp a rare chance for semi-regular playing time in the big leagues. 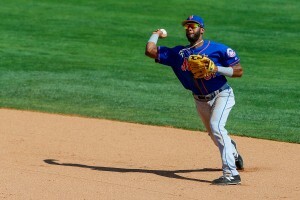 Kemp is doing his best Jose Altuve impersonation down in Triple-A, and it’s not just because he’s a 5’6″ second baseman. The 25-year-old is slashing .324/.376/.465 with 19 stolen bases, 31 walks and 32 strikeouts in 90 games. His ability to play left field—he started 24 games there for the Astros in 2016—and left-handed bat should give him plenty of value on the Astros’ roster down the road, even if he’s destined to be a bench player. But it’s probably a good time to find out if he can be more than that. Somewhat surprisingly, the White Sox did not trade free agents-to-be Miguel Gonzalez and Derek Holland prior to the deadline, which would’ve cleared a path to the big league rotation for Lopez — one of several elite prospects that the team has acquired since the offseason. 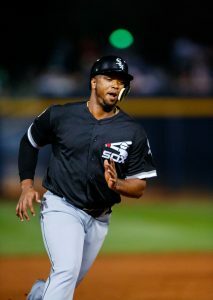 The 23-year-old Lopez, who came to the ChiSox in the Adam Eaton trade, could be forcing the team’s hand anyhow, though. In his past six starts, he has a 1.97 ERA with 26 hits allowed, eight walks and 49 strikeouts over 36 2/3 innings. He hasn’t allowed more than two runs over that span and has three 10+ strikeout games. It will be a surprise if he makes more than two more starts in Triple-A. Mark Reynolds has been productive enough in 2017 that a less-than-stellar month of July (.229/.319/.410) won’t cause him to lose his starting job, especially to a rookie with zero Major League at-bats. But it’s getting to the point in the season where it makes sense for the Rockies to at least give the 22-year-old McMahon, the No. 1 ranked player in Roster Resource’s MiLB Power Rankings, some occasional starts at first base while utilizing him occasionally at other spots on the diamond. McMahon, who has played a good amount of games at first base, second base and third base this season, is 19 for his last 34 to push his Triple-A batting average to .396 (86-for-217). Overall, he’s slashing .364/.406/.598 between Double-A and Triple-A with 36 doubles and 17 homers. It’s safe to say that he has very little left to prove in the minors. Despite hitting only 10 homers in the low minors over his first three professional seasons, Smith was a highly-touted prospect who many experts believed would develop power at some point. They were right. And it didn’t really take that long. Since reaching the upper minors as a 20-year-old in 2016, the left-handed hitting first baseman has 30 homers and 62 doubles while hitting over .300 and maintaining a disciplined approach at the plate. Even after trading Duda, the Mets are holding off on calling up the 22-year-old Smith for some reason. That’s difficult to do after he slashed .385/.437/.725 in July, but this is the organization that called up Amed Rosario, arguably, two months after he was making it clear that he was ready for the Major Leagues. 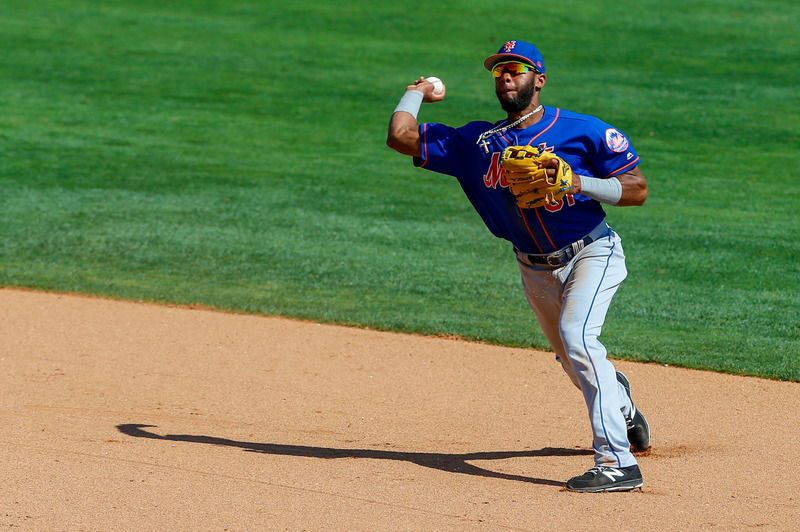 GM Sandy Alderson has suggested that they won’t wait much longer on Smith, though. He should settle in as the team’s first baseman before the end of the month. The Brewers’ starting rotation has been much better than expected and, arguably, the biggest reason why they’re sitting atop the NL Central with a 41-37 record. But while their five starters are healthy and performing well at the moment, the team’s rotation depth has taken a hit as of late. Top prospect Josh Hader was moved to a relief role in order to balance out a right-handed heavy bullpen, and Brandon Woodruff landed on the disabled list when he suffered a strained hamstring just before his MLB debut. All of a sudden, Burnes is not only rocketing up the prospect lists with his impressive performance in 2017, he could actually help a playoff-contending Brewers team at some point. A fourth-round pick in last year’s draft, Burnes posted a 1.05 ERA in 10 High-A starts before a June promotion to Double-A. The 22-year-old right-hander hasn’t slowed down one bit, allowing two earned runs and 10 hits over 23 2/3innings in his four Southern League starts. He threw close to 140 innings in 2016 between the NCAA and the Minor Leagues, so it’s realistic that he can exceed 150 innings this year—he’s currently at 83 2/3—and that some of those innings might actually be thrown at the Major League level. The Twins’ patience with Byron Buxton paid off as he was productive over a 146 plate appearance stretch (.746 OPS from April 21-June 14) after a slow start. But he’s gone ice cold again—he’s 5 for his last 38 with no extra bases and 13 strikeouts—while the Twins have been one of the worst offenses in baseball this month. If they’re looking for a spark, and a player who can at least spell Buxton occasionally in center field, it’s becoming clear that Granite could be a solution. After his third consecutive two-hit game on Monday, the 24-year-old has a Triple-A slash line of .365/.419/513 in 48 games. His 17 walk-to-22 strikeout ratio might be his most enticing stat considering that Buxton and left fielder Eddie Rosario have combined for 34 walks and 127 strikeouts. Mahle is the first player to earn “Knocking Down The Door” honors for a second time in 2017, although he was dominating at the Double-A level when I pegged him as a potential call-up in early May. This time around, he’s coming off of an impressive Triple-A debut in which he pitched four-hit ball over six innings with no earned runs allowed and nine strikeouts. A struggling Reds’ rotation was hoping for a shot in the arm with Homer Bailey and Brandon Finnegan both back from the disabled list. But Bailey’s 2017 debut was disastrous (1 2/3 IP, 8 ER) and Finnegan is headed back to the DL with a shoulder injury. The Reds have already used an NL-leading 12 starting pitchers and are certain to dip into their farm for reinforcements again at some point. Will the 22-year-old Mahle be the 13th? Fernando Rodney and Archie Bradley have been the keys to solidifying what appeared to be a very suspect Diamondbacks bullpen heading into the season. But, will it hold up down the stretch as they try to lock down their first playoff berth since 2011? It would be a surprise if general manager Mike Hazen didn’t acquire some late-inning help prior to July 31st, but they could also take a look at some potential in-house options prior to the deadline. Moya, a 22-year-old who has been close to unhittable as the Double-A closer, should be considered. The left-hander out of Venezuela has allowed a run in only two of his 26 appearances while holding opponents to a .139 batting average and walking only 12 hitters with 52 strikeouts in 34 1/3 innings. Right-handed hitters have a .107 batting average against him, which is at least an indication that he could be more than a situational reliever. With Chance Adams still waiting for a much-deserved and much-anticipated MLB call-up, Smith’s work in Triple-A has gone relatively unnoticed. The 25-year-old lefty has made 14 starts in 2017 and has allowed two earned runs or less twelve times, including back-to-back gems (13 IP, 0 ER, 7 H, 2 BB, 13 K) to lower his ERA to 2.84 with impressive peripherals across the board (6.5 H/9, 2.3 BB/9, 8.5 K/9). In an ideal scenario for a non-competitive A’s team, Trevor Plouffe would already be generating interest on the trade market with Chapman ready to take over at the hot corner sometime in August or even September. Instead, the A’s aren’t anywhere close to a playoff spot and Plouffe’s trade value might be as low as it’s ever been—he has a .640 OPS and is in a 7-for-53 slump with 20 strikeouts over that span. Therefore, moving up the 24-year-old Chapman’s MLB debut seems more likely by the day. The 25th overall pick in the 2014 draft, Chapman had a rough start to the season. After going 0-for-7 with six strikeouts, he injured his wrist and missed the next two weeks. He had just three singles in his first 23 at-bats after returning, but he finally caught fire in early May and hasn’t slowed down since. He finished May with 11 homers and a 1.031 OPS. So far in June, the right-handed slugger has hit five out of the park and has a 1.014 OPS. Ryon Healy was called up in mid-July of last season. At this rate, Chapman should be up prior to the All-Star break. Heading into the season, Eshelman couldn’t have been higher than 10th on the Phillies’ starting rotation depth chart. Just two months into the season, though, he’s making a strong case to be next in line. Injuries to Clay Buchholz and Vince Velasquez have helped, but the 22-year-old’s quick rise has mostly been a result of his performance. In 12 starts—seven in Triple-A and five in Double-A—Eshelman has posted a 2.11 ERA with only 10 walks and 59 strikeouts in 81 innings. Since two somewhat shaky starts to begin the season with Double-A Reading (10 IP, 4 ER, 13 H), he’s been lights out, completing at least 6 innings in his last 10 starts with no more than one walk allowed and a 1.90 ERA. While it seems unlikely that Font makes a start for the Dodgers in 2017, it’s hard for them—or other teams around the league—to not be intrigued by the significant jump in his strikeout rate this season. In 12 starts over 65 innings, the 27-year-old right-hander has 95 strikeouts and only 13 walks. That’s more than two walks below and two strikeouts above his career BB/9 (4.1) and K/9 (10.6) rates over his lengthy Minor League career. He’s also keeping runs allowed at a minimum, posting a 3.15 ERA over his last 11 starts, including a 15-strikeout game in which he was perfect through six innings. As important as pitching depth is, it’s likely that the Dodgers will hold on to Font just in case he’s needed at some point to give them some innings. But it also wouldn’t be a big surprise if a team in need of a starter tries to pry him away from the Dodgers in the near future, allowing them to cash in on a Minor League free agent acquisition. Top prospect Christian Arroyo was able to give the Giants a spark upon his arrival in the big leagues—he held his own at the plate and had a few big homers early on—but slumped badly before he was demoted in early June. He’ll be back at some point, but the 22-year-old might be better off staying in Triple-A until September. 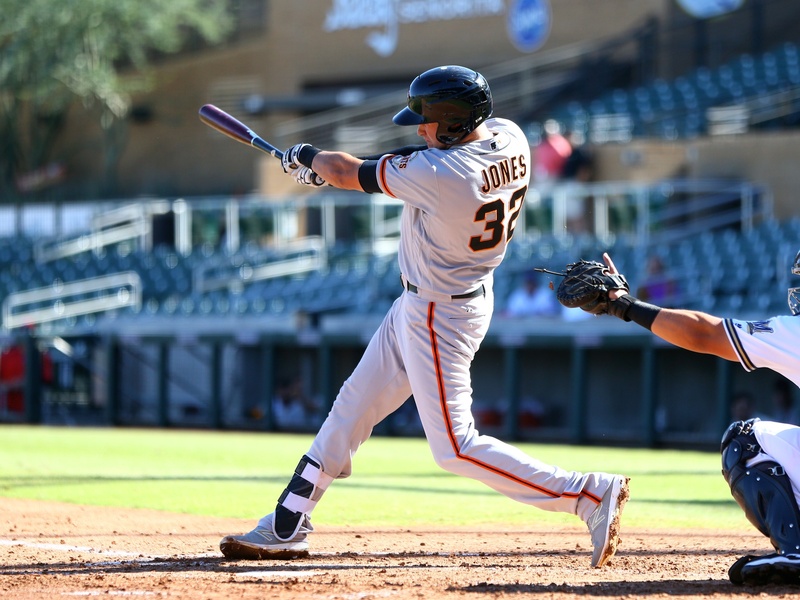 In the meantime, the 23-year-old Jones has set himself for a possible promotion with an impressive display of hitting (.292/.392/.522; 7 HR, 12 2B) and defensive versatility (he’s primarily a third baseman, but he’s also played left field, right field, first base and shortstop). Unless the struggling Giants can turn things around in the very near future, it’s likely that third baseman Eduardo Nuñez will be on the trade block, which could give Jones an opening to regular playing time. For now, his left-handed bat and ability to play multiple positions could help the team during their last-ditch effort to jump back into the playoff picture. Injuries throughout the Blue Jays’ infield have kept Ryan Goins busy—he’s started 40 of the team’s 63 games—but, as would’ve been expected, he’s not providing much offense (.605 OPS). A healthy return from Devon Travis, who is on the disabled list with a knee injury, would push him back to a bench role. But given Travis’ extensive injury history and without a current timetable for return, it could be a good time to give Leblebijian a look at second base. The former 25th Round draft pick has a .310/.380/.518 slash line with eight homers and 11 doubles in his first 57 Triple-A games. While his International League numbers aren’t likely to carry over to the Majors, they’re interesting enough, along with his strong defensive ability, to find out if he’s capable of helping the Jays out now. This week’s installation of “Knocking Down The Door” includes two highly-touted center field prospects, a reliever who had been doing his best Kenley Jansen impression in Double-A before a recent promotion to Triple-A, and a pair of starting pitchers who can’t be too far off from making their MLB debuts after dominating in their last outings. If the Yankees, one of three teams in baseball to have only used five starting pitchers this season, need to dip into their farm system for rotation help, they appear to be in good shape with Chance Adams waiting in the wings. The 22-year-old right-hander has risen up the ladder swiftly without much of a struggle in 220 2/3 minor league innings. After posting a 1.03 ERA in six Double-A starts to begin the season, he hasn’t slowed him down one bit since a promotion to Triple-A. He recently lowered his ERA to 1.57 after tossing one-hit ball over six shutout innings with two walks and a season-high 12 strikeouts in his fourth start with Scranton/Wilkes-Barre. There doesn’t appear to be an immediate opening in the Yankees’ rotation, although Masahiro Tanaka’s recent performance—21 earned runs and 30 hits over his last 17 2/3 innings—might be an indication that he’s not completely healthy and could use a stint on the disabled list. Acquired from the Mariners this past offseason for Danny Valencia, Blackburn has not wasted time in impressing his new organization. After not allowing a run in three of his last four starts, including seven shutout innings on Sunday, the 23-year-old has his ERA down to 3.26 with a 2.4 BB/9 and 6.7 K/9. With Jharel Cotton’s demotion to Triple-A last month lasting only two starts due to injuries to Kendall Graveman and Jesse Hahn, Blackburn’s emergence could afford the A’s the opportunity to get him back down to there to work on things for an extended period this time around. It’s clear that Fisher’s overall game needs some work—50 strikeouts in 53 games; caught stealing 10 times in 19 attempts—and the powerful Astros lineup doesn’t appear to need any help right now. But it’s hard to ignore the rest of his numbers (.338/.397/.606; 14 HR, 16 2B, 19 BB) and not wonder how much more firepower he could add to the bottom of the Astros’ lineup in place of left fielder Nori Aoki, who isn’t doing much out of the No. 9 spot (.624 OPS). Prior to a hitless game on Sunday, the 23-year-old Fisher had been on a nine-game hitting streak in which he had a .486 batting average (18-for-37), four doubles and four homers. It would likely benefit him to continue working on his game down in Triple-A, but he could also learn on the job in a low-pressure environment while giving the Astros much more production than they’re currently getting out of left field. When the Pirates were in need of an outfielder in mid-April after the 80-game suspension of Starling Marte was announced, Meadows was in a deep slump and not deserving of his first MLB call-up. 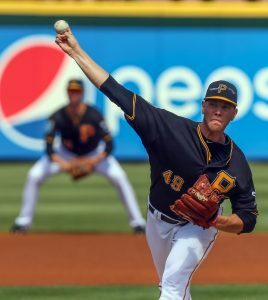 With Marte’s return still more than a month away, however, it’s not too late for the Pirates to get a look at their top prospect, who has turned things around and has the potential to give a struggling team a much-needed shot in the arm. Since posting a .503 OPS with five walks and 20 strikeouts in April, the 22-year-old has hit .302 with two homers, 12 doubles, 11 walks, 20 strikeouts and six stolen bases over his last 31 games. Adam Frazier, who is currently getting most of the starts in left field, has been one of the few bright spots for the Pirates. His ability to play multiple positions, however, makes him valuable as a super-utility man, which will be his role if Meadows gets the call. Therrien is only one scoreless appearance into his first Triple-A stint, but if his numbers at Double-A are any indication—1.26 ERA, 28 2/3 innings, 14 hits, three walks, 39 strikeouts—the 24-year-old right-hander shouldn’t be far away from helping a beleaguered Phillies bullpen. With Joaquin Benoit on the disabled list, Jeanmar Gomez demoted to the bottom of the depth chart and Edubray Ramos not having the impact the team was hoping for, the rebuilding Phillies could not only use some reinforcements, they could also start looking towards the future and finding out which young arms will be able to help them in 2018 and beyond.